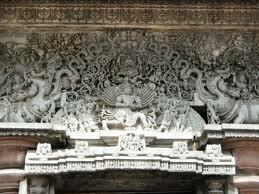 Here is Some information about Chennakesava Temple in Belur Karnataka India. 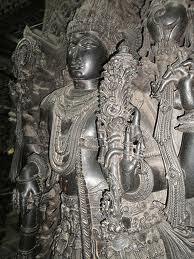 Chennakesava Temple is one of the finest testaments constructed using soft soapstone. 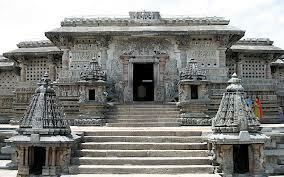 The ancient shrine at Velapuri belonging to the Hoysala period is famed for the 48 carved pillars in various designs. 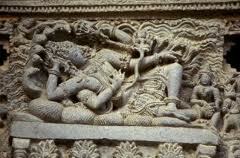 Chennakesava or Lord Vishnu is the chief deity of the Chennakesava Temple complex. 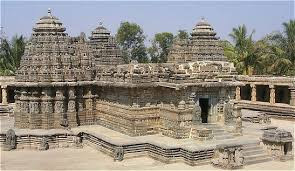 The temple was consecrated to mark the victory of King Vishnuvardhana of Talkad over the Cholas during 1117. 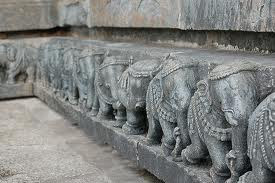 Carvings of elephants, episodes from the Puranas, the Upanishads and the epics of the Ramayana and the Mahabharata draw attention of tourists. 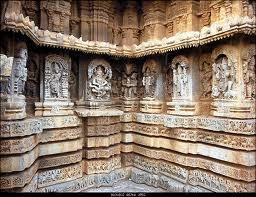 Some other attractions of the complex are the sculptures of Madanakai damsels and carvings in navaranga. 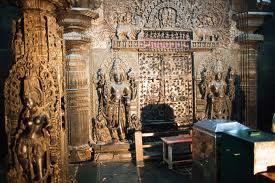 Along with the temple, there are several shrines in the rectangular complex called as veranda. Most of the complex is in ruins comprising pillared hypostyle hall (navaranga), a square vestibule (antale) and stellate vimana. In the complex, there is a shrine named as Kappe Chennigaraya Temple. The shrine was constructed by Shantaladevi, queen of famous King Vishnuvardhan. 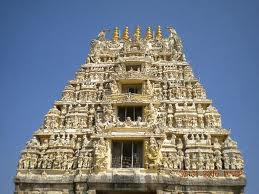 The main entrance to the complex is crowned by a Rayagopura built during the days of Vijayanagar empire. 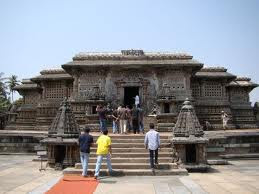 This is the first great Hoysala temple, though the artistic idiom is Western Chalukyan. 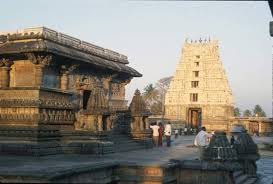 The Chennakesava temple has three entrances and the doorways have decorated sculptures called dvarapalaka(doorkeepers) on either side. The original shrine has a star-shaped plan while the additional shrine is a simple square. The icon inside is that of Kesava and was commissioned by Shantala Devi, queen of king Vishnuvardhana. The building material used in the Chennakesava temple is chloritic schist (soapstone) and is essentially a simple Hoysala plan built with extraordinary detail. 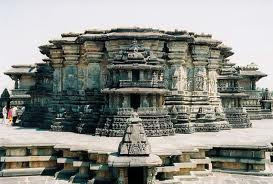 What differentiates this temple from other Hoysala temples of the same plan is the unusually large size of the temple. The temple is a ekakuta vimana design (single shrine) of 10.5 m by 10.5 m size. A large vestibule connects the shrine to the mandapa (hall) which is one of the main attractions of the temple. The mandapa has 60 bays. 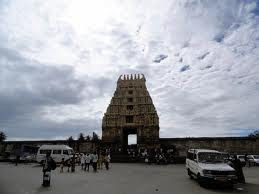 The superstructure (tower) on top of the vimana has been lost over time. The temple is built on a jagati (platform). There is one flight of steps leading to the jagati and another flight of steps to the mantapa. The jagati provides the devotee the opportunity to do a pradakshina (circumambulation) around the temple before entering it. The jagati follows the staggered square design of the mantap and the star shape of the shrine. The mantapa here was originally open. A visitor would have been able to see the ornate pillars of the open mantapa from the platform. The mantapa is perhaps the most magnificent one in all of medieval India. 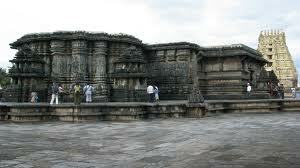 The open mantapa was converted into a closed one after about 50 years, during the Hoysala rule. This was done by erecting walls with pierced window screens. The window screens are on top of 2 m high walls. There are 28 such windows, with star-shaped perforations and bands of foliage, figures and mythological subjects. By Road: Bangalore - Nelamangala - Kunigal - Channarayapatna - Hassan - Belur. From Hassan District Head quarters, this place is around 40 Kms. By Rail: The Nearest Railway Station is Belur junction. By Air: The Nearest airport is Bangalore.